Founded in 1973, Ross Reels has been an avid producer of top-quality reels for over four decades. Since their original formation, there have been many changes to the manufacturing process, but their values have always remained the same. 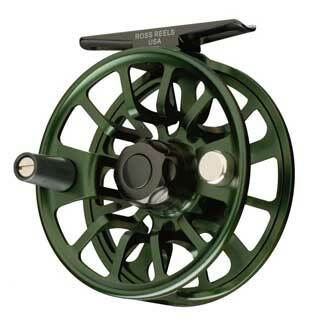 Ross Reels is dedicated to providing high-quality fly fishing reels. Their company values are defined by the tagline, "Made on the Water," meant to represent their dedication to quality and innovation. Before being released on the market, each and every reel undergoes a vigorous testing process to ensure that durability and performance will last over time. Made entirely in the United States, Ross Reels is a thoroughly traditional American company, striving to provide the highest quality reels made from the highest quality components. Ross Reels has continuously defined what fly fishing reels can and should be, making them a valuable tool for any fly fisherman. When looking for the best Ross reel for your fishing needs, it can be difficult to narrow down your search. There are many available options, and even more product specifications to consider. This review will take an in-depth look at the top-rated Ross reels that are currently on the market. To provide expert guidance when searching for Ross reels, we have compiled a comprehensive list of the top five reels that have gained consistent amounts of praise, from professional and amateur anglers alike. Each and every component of these reels is closely analyzed to see what qualities set these Ross reels apart from the competition. By looking at the top-rated Ross reels, each and every fisherman will find themselves well-equipped to choose the perfect Ross reel for their fishing needs. Designed with freshwater, warm water, and saltwater environments in mind, the Ross Animas Reel is an excellent fly fishing reel, capable of providing high speed and high versatility. Its solid aluminum frame has an anodized finish to protect against even the most brackish fishing environments. Though the reel is listed in a large arbor sizing, the aluminum helps to decrease overall weight without sacrificing the durability of the reel. With a smooth and powerful drag system, this is one of the most efficient fly fishing reels on the market today. Additionally, the large arbor provides plenty of room for increased line length and is durable enough for increased line weight, as well. This fly fishing reel can easily accommodate up to a 9-10 fishing line weight, although other models can go up to a 10-12. The ability to transfer this Ross reel between saltwater and freshwater environments is one of the best attributes of the reel. While proper cleaning methods should be followed after each saltwater use, it is beneficial to know that the components of the reel have been specially formatted to withstand the unique wear and tear from saltwater environments. The Ross Flyrise fly reel features the newest technological innovations, making this one of the top-performing Ross reels. The award-winning Evolution LT drag system involves a triple redundancy drag system. Three separate backup drags work together to ensure that the reel continues to bring maximized performance when working against the toughest and strongest of fish species. The drag system has been improved even further by introducing Teflon. This makes the drag durable, heat-resistant, self-lubricating, and maintenance free. Additionally, a new drag knob design features smooth rotation to create precise and secure drag settings. At 4.4 ounces, the Ross Flyrise fly reel is a thoroughly lightweight and manageable reel, making transportation and extended periods of fishing much easier. While plenty of reviews heap praises for the smooth and efficient drag system, that is not the only benefit that comes with this Ross reel. Others have noted that the reel separation mechanism is particularly useful, allowing for easy line replacement. As an updated version of the original Evolution fishing reel series, the Evolution LT is an advanced and thoroughly improved version of a classic favorite. This reel comes with an aluminum spool cap, escapement cover, and drag knob, making it one of the most lightweight reels in its category. The spool and frame are both ventilated, ensuring that the increase in metal doesn’t compromise its lightweight nature. The triple redundancy drag system increases dependability, providing extra backup for the toughest of fish. The Ross Evolution model also provides a seamless transition between line-in and drag engagement reduces drag friction, making for an overall fluid performance. Integrating Teflon materials provides a thoroughly durable, self-lubricating and heat-resistant drag system. The spool itself features a quick release lock, along with an easy conversion between left and right-hand retrieve settings. Aside from its high level of performance and durability, the Ross Evolution LT reel also gets tons of praise for its flawless look. The brushed aluminum provides a sleek appearance, making this Ross reel just as aesthetically pleasing as it is efficient. 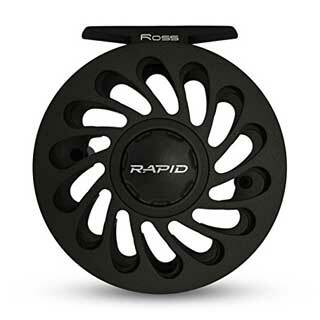 The oversized arbor design of the Ross Rapid reel provides two essential benefits for fly fishermen: it reduces the line memory and also facilitates a lightning-quick pick up. Not only does this enhance the speed of the reel, but it creates an improved overall performance while fly fishing. The super-smooth Rulon disc drag is one of the best features of this Ross reel. Not only does it provide smooth and reliable performance, but the drag is also infinitely adjustable. The disc drag also provides maximum power to handle a variety of fish sizes. This allows anglers to exert greater control and precision when reeling in their catch, particularly with larger, fighting fish. With the inclusion of a reverse tapered Delrin handle, this Ross reel comes with a solid grip and an ergonomic feel. When combined with the extremely quiet inbound retrieve, the Ross Rapid model comes with an overall desirable feel and performance. 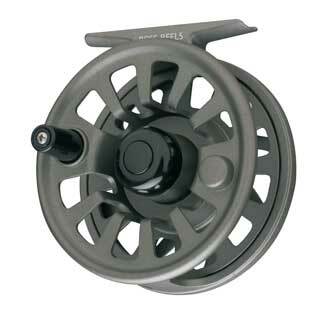 While most reels tend to be made of machined aluminum, this Ross reel is made from cast aluminum. Cast aluminum is a special hybrid that helps maximize the weightless nature of aluminum without sacrificing overall durability. As an additional benefit, it is also a more affordable metal to invest in. As a result, the Ross Rapid fly fishing reel manages to combine durability, lightweight qualities, and overall affordability into one reel. 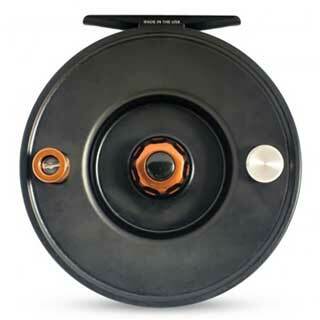 The Ross Flystart fly fishing reel offers maximum performance that requires little to no maintenance. Not only is the drag system highly effective, but it is also capable of maintaining efficiency without constant supervision. The drag system is self-lubricating, eliminating the need to add more lubricant to the drag constantly. As an additional benefit, the spool itself also comes with this same self-lubricating feature. The stainless steel spindle is infused with oil, offering a consistently smooth performance as soon as fish begin pulling. The Flystart fly fishing reel also comes with an easy transition between left and right-hand retrieve. This makes purchasing and using the reel much easier, as the reel can be quickly formatted to fit specific preferences and strengths. 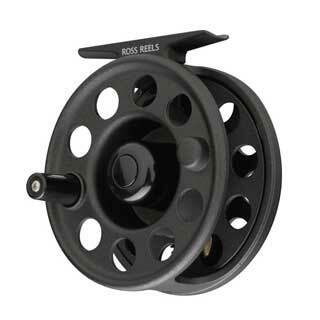 With an affordable price point and ease of use, this Ross reel is the perfect choice for beginners. Not only is the performance simple and reliable, but the reel itself is easy to operate. For a high-quality beginners’ reel at a low price, anglers can’t go wrong with the Flystart fly fishing reel. As a company, Ross Reels has established a long and trusted tradition of creating the most innovative and efficient fly fishing reels. Their continued commitment to producing high-quality fly fishing reels maintains their widespread reputation for being a competitive and worthwhile reel company. Choosing the best Ross reel for you means taking a close look at the top-rated Ross fishing reels. Closely examining these highly praised reels can help pinpoint the best Ross reel for your fishing needs, particularly if you are in the market for a reliable and efficient fly fishing reel. When looking for your next Ross reel, make sure to take fishing environment, structural components, and performance into account. All of these elements come together to create high-quality, top-rated Ross reels. Regardless of the reel that you choose, anglers of all backgrounds and experience levels can rest assured that investing in a Ross fishing reel means investing in decades of dedication to accessibility, performance, and innovation.